Having taught American history a number of times, each time writing (and re-writing) her own materials, Celeste has shared her love of history with many students in her homeschool classes. Designed to be engaging and written in a comfortable style, All American History reads like a good book bringing America’s story to life piece by piece. 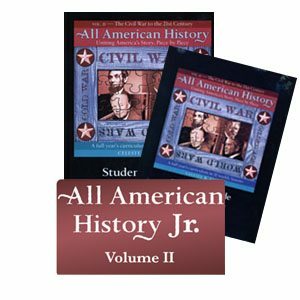 Containing hundreds of images and dozens of maps, All-American History Volume I is a complete year’s curriculum for students in grades 5 – 12 when combined with the digital Student Activity Book and softcover Teacher’s Guide. It is also adaptable for younger students. The first volume covers Exploration through 1840. Each week includes a chapter from the Reader, maps, forms, and review questions in the Activity Book, and plenty of hands-on and further research ideas in the Teacher Guide. (As well as great teaching tips, ANSWERS to everything, and a great book list!) 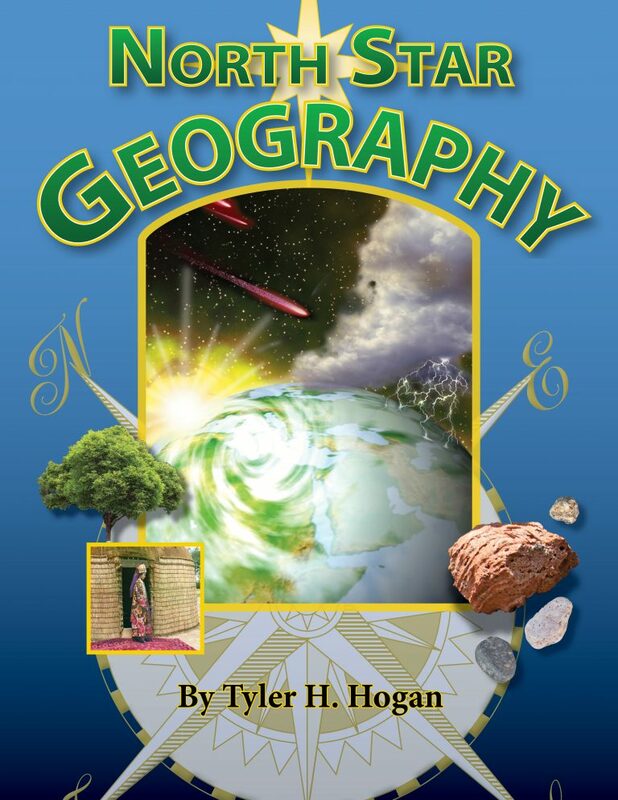 The teacher book also provides additional hands-on and further research ideas for the younger students you may use this with. My kids are getting a great foundation in American history. They may never love history (I never did, until I became an adult), but I don’t think they’ll find it boring and I am confident in the fact that they are learning important truths about how our nation was born. To be honest, I’ve already learned things that I never got out of my own American history education – interesting facts that I’ve shared with my husband about how the different things going on in Europe during the 1400’s culminated in the European’s need to explore faster, better trade routes, which ultimately led to the discovery of the Americas. I am always on the look out for quality material that is at least secular friendly. My husband and I recently had to return a product which was beautiful, but overtly indoctrinating and slanted history towards one belief set, so the hopes were high that this one would be more neutral on that issue. 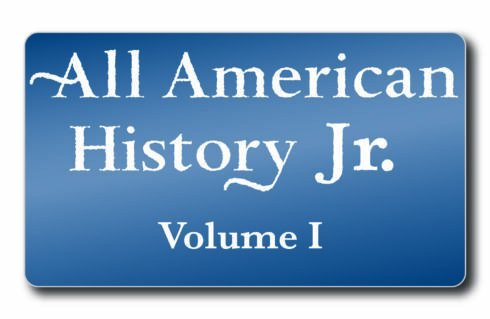 I am glad to report that All American History is history, very honestly written. The writer brings up the societal issues of the time period being discussed, and this does on occasion include religion where relevant, but it is informational, and educational in its purpose. My husband is quite particular on that, because he’s probably more tired of biased history than I am, given that he’s the history student (addict). He studies it every day and is in the middle of WWI … again. I think he could teach a college course on it if he wanted to. So when a history product gets my ultra-picky husband’s seal of approval, it really is that good, and I am a happy camper! 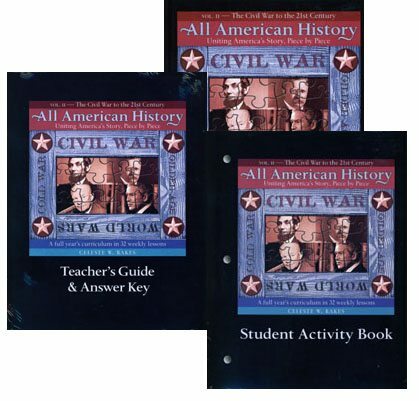 This Digital Download includes eight tests, each covering four lessons (weeks) from All American History Volume I. Tests consist of multiple-choice, true/false, matching, and map work questions. The answer keys are included. These are reproducible within your own family. Having taught American history a number of times, each time writing (and re-writing) her own materials, Celeste has shared her love of history with many students in her homeschool classes. Designed to be engaging and written in a comfortable style, All American History reads like a good book — bringing America’s story to life piece by piece. 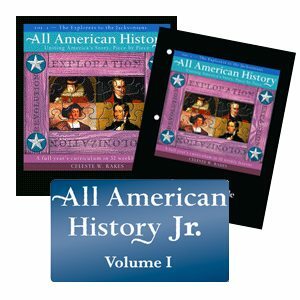 Containing hundreds of images and dozens of maps, All-American History Volume I is a complete year’s curriculum for students in grades 5 – 12 when combined with the Student Activity Book and Teacher’s Guide. It is also adaptable for younger students. The first volume covers Exploration through 1840.